Values guide your behaviour. They give meaning to what you do. They depict who you are and what you stand for. Values are therefore the foundation of any organisation’s policies and programmes. 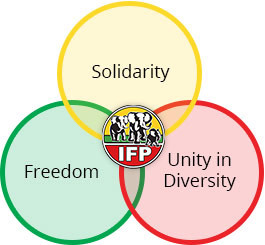 The IFP has three key values. These are: Solidarity, Freedom, and Unity in Diversity. They are all interconnected. Each is associated with other, secondary values. In our service to the people, the IFP will stand by those affected by poverty, unemployment, abuse, crime, violence and other social ills and discrimination. South Africa has an enormous number of people who, left to the exigencies of the market or a minimalist state, would suffer even more severe depredations than those which fate has bestowed upon them. The IFP will not stand aloof as our people suffer, but will work with them, as an expression of compassion and fraternity in providing assistance. We seek a South Africa in which the potential of every person to a dignified life can be realised, with integrity, within a democratic environment. Internally, we believe everyone has the right to participate in party affairs and to advance themselves so long as their activities are premised on integrity. Everyone within the party has the right to speak and to be heard, to be treated with dignity, and to stand for any office. We embrace internal democracy, transparency and accountability. On the national stage, we stand for a constitutional state in which individual rights are protected against intrusive government, in which the poor and vulnerable are assisted, and in which the autonomy of civil society is not infringed upon. We embrace our differences and reject the notion that we are all the same. We are equal under the law, of course, but South Africa is nonetheless made up of many different cultures, groups, races, religions, communities and peoples. None of these is more important than any other, though we do embrace Christian and other faith-based values. The IFP welcomes all into our fold. We are inclusive, we promote multiculturalism and we encourage the sharing of power among our constituents. The IFP is a home for all South Africans subscribing to our values and policies. Everyone is welcome to join with us in our great quest to make South Africa a better country. These values reflect who we are in that they guide our conduct as a political party. They equally reflect what we aspire to for the country as a whole.